Microservices is still a distributed-systems problem and integration is a core component to any distributed system. Many organizations thinking about deploying microservices struggle with VM proliferation; how to test, deploy, and manage; and ultimately how to reliably integrate services. 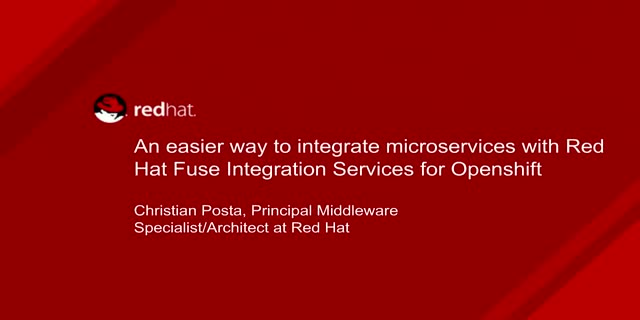 Fuse integration services for OpenShift by Red Hat® is a docker-native way of packaging microservices to take advantage of powerful integration technology built on Apache Camel. This solution connects the pieces together—either using REST, CQRS, event sourcing, or other powerful microservice patterns and architectures. Modern application development and maintenance using microservices architecture, containerized infrastructure, and DevOps principles is much more effective than legacy methods. Being able to create and easily re-define business rules is a competitive advantage in today's quickly-changing environment. Business rules are at the heart of every organization’s operations. They define the laws and regulations to which the organization is bound, they drive business process decisions, and they determine pricing of products and services. Microservices modularize monoliths into small services with open and standard interfaces that can be individually implemented, deployed and scaled. Containers provide the environment where microservices operate (OS, runtime, libraries, configuration). - Help you quickly extract documented or implicit business rules and explicitly define them with a standard and centrally managed rules language. - Let you package those explicitly defined rules into containers and deploy them as microservices. Feeling bludgeoned by bullhorn messaging suggesting your monolithic behemoth should be put down (or sliced up) to make way for microservices? Without question, 'unicorn-style' microservices are the super-nova-hot flavor of the day, but what if teaching your tried and true monolith to be a nimble, fast-dancing elephant meant you could deploy every week versus every 6 to 9 months? For most enterprises, weekly deployments (or something close) would fundamentally transform not only operations and business results, but also the inherent value of developers willing to step up to lead the dance lessons. See beyond the hype to understand the deployment model your business case actually demands, and if weekly deployments courtesy of a dancing (or flying!) elephant fit the bill, love the one you're with as you lead the organization's journey to digital transformation! The ability to integrate APIs from multiple sources is critical to success. New approaches to enterprise integration, backed by flexible, cloud-ready technologies, are necessary. Agile integration, an architectural approach, combines agile methods and practices with technologies for the purpose of rapidly integrating applications and data.The webcast will present how to achieve an agile application integration environment on your journey to becoming a digital business. The webcast is intended for system architects and application developers. - Analyzing large-scale application portfolios for modernization opportunities. - Modernizing existing applications with containers, CI/CD, and DevOps principles. - Creating a business case. - Structuring transformation project teams. - A proven methodology for migrations. Given the sheer pace of innovation and ever-increasing competition in today’s marketplace, organizations are leaning on the CIO more than ever before to lead a lean, agile enterprise. For IT teams, this has translated into delivering faster, at greater scale, and more efficiently. These same demands have also catalyzed a demand for new applications that are delivered both more nimbly and more quickly. This places further stress on the IT Operations team, as they are now tasked with providing a scalable, on-demand infrastructure that can service both developers and the business. As these expectations converge, IT leaders can no longer focus solely on a management strategy – they must also consider, “What is our automation strategy?” Red Hat and Intel are bring together senior IT executives from across industries for this webinar: Driving Change in IT Ops through Automation. Join us for a brief presentation that will explore how automation can help transform IT operations for the next generation of IT management, followed by a panel of senior IT executives as they discuss the challenges and best practices related to these topics and more. Virtualization configuration management should be an easy and automated process that allows your team to continuously deliver innovation. Furthermore, you need to be able to provide speed, efficiency, and security for the DevOps and virtualization administration teams with simple architecture and management tools. > Quickly and easily provision, deprovision, take inventory, and manage your virtual infrastructure. > Empower your non-administrative users to confidently and securely request and manage virtual resources using provided playbooks. > Provide flexibility and control while speeding up development. > Add new capabilities to your continuous integration, improving the cycle times and agility of your application teams. Massive changes in healthcare delivery, regulation, and payment make connectivity and integration more important than ever. Collaboration can be among patients and doctors, among hospital staff, and among hospitals and other healthcare organizations—including insurance companies. APIs are a great tool in facilitating this collaboration. Join this webinar to learn about Red Hat® integration technologies that provide healthcare business value beyond integration and API engines to support value-based and patient-centered care, healthcare Internet of Things (IoT), and other emerging healthcare goals. • How integrated, open source offerings can provide seamless, intelligent, and transformative interoperability. • How APIs can facilitate collaboration. • How APIs support digital services in healthcare. • The highlights of Red Hat JBoss® Fuse, Red Hat 3scale API Management Platform, and related technologies. • How this unique approach helps meet the pressing interoperability requirements in healthcare with flexible deployment options. • How Red Hat customers are using this technology now. Assessing performance of a general and flexible business process management (BPM) products and solutions is challenging. It's notoriously difficult to assess, measure, and accurately predict how a product or solution will scale under normal use and load. Each user's unique business requirements and specific implementation design must be taken into account. Red Hat has partnered with Vizuri, an IT consulting firm, to provide you with a performance test tool for any BPM framework or process server. The BPM performance test tool can be used to model and assess many different scenarios simulating a set of reusable resources. The results will be a uniform performance evaluation that accounts for as much end-user process design and implementation variability as feasible. Join this webcast to learn more about this tool through a case study on Red Hat® JBoss® BPM Suite. Process-oriented mobile applications have the power to transform the way organizations approach digital business. To get these apps to market fast and adapt them on the fly, low-code development tools and approaches are necessary to take the burden off IT and let the business self-serve via the citizen developer. - Why digital business places new demands on process-oriented mobile applications. - Agile business automation—the intersection of mobile, business process management (BPM), and low code. - 3 mobile and BPM use cases from the field: Field workforce management, asset management, and self-service applications. APIs, integration, containers and a range of other technologies are all creating new opportunities to retool enterprise IT. However, using these new tools to forge a coherent platform strategy that is flexible yet robust remains as tough as ever. In this webinar Steve Willmott, Sr. Director and Head of API Infrastructure at Red Hat, discusses how to address the platform challenge using key insights from real-world customer examples. Fully supported, agile, and cost-effective cloud integration platforms based on industry standards are ideal for healthcare organizations. With broad connectivity and support for Health Level 7 (HL7) transaction sets and more than 150 standard connectors, Red Hat JBoss Fuse can help streamline operations, simplify development and deployment, and easily adapt to industry changes. The healthcare industry is rapidly changing, and with oceans of sensitive data and complex networks, it's crucial for health IT teams to stay on top of the trends. - How integrated, open source offerings can provide seamless, intelligent, and transformative interoperability. - An overview of Red Hat JBoss Fuse and related technologies such as complex event processing, rules, and application program interface (API) management. - How this unique approach helps meet the pressing interoperability requirements in healthcare. The world is full of scheduling problems: employees to shifts, delivery routes to vehicles, aircraft and crews to flights, and manufacturing jobs to machines, just to name a few. Solving these problems optimally is often key to a businesses’ success, and yet the technology and knowledge needed to do it is often only available to the largest of enterprises. Until now. Red Hat® JBoss® BRMS includes a business resource planner based on the popular OptaPlanner open source project. It offers a range of powerful optimization algorithms that enable regular Java™ developers to quickly build solvers for many common optimization problems. - Work through some actual examples and use cases whose solutions demonstrate business benefits. - Leave equipped with tools and resources to start solving your own business planning problems. Healthcare companies are facing complex interoperability challenges—connecting multiple applications while also providing a consistent customer experience. Increased government regulations on meaningful use and value-based care make things even more challenging. Open source cloud integration platforms, like Red Hat® JBoss® Fuse, can help overcome these challenges and provide better patient outcomes by connecting applications, Application Program Interfaces (APIs), and data. We live in an application economy, and companies who don’t recognize themselves as software or technology-driven are doomed to fail. Core aspects of digital transformation are being enabled by the way applications are built (agile methods, event-driven) the way they are deployed (containers, microservices) and the way in which they are used (mobile, IoT). Red Hat’s portfolio addresses all aspects of the application lifecycle, and can help prepare you to use software as a cornerstone for competitive advantage. Custom software development and business automation have historically provided 2 equal but distinct paths to bring high-quality products to market. Each has its own benefits and trade-offs. Business process management (BPM) and business rules management systems (BRMS) provide a lightweight, modular platform that can be tailored for your organizational structure and technical architecture. Red Hat® Consulting offers a Business Automation Practice—a design model that combines the rigor and security of software development with the speed and accessibility of business automation technology. The result? Businesses can develop better products, more quickly and fully evolve with DevOps. With the increased speed of business and the transitory nature of apps and services, agility is paramount. To meet this need, successful organizations have turned to DevOps philosophies and solutions based on microservices architectures (MSAs). Application programming interfaces (APIs) are crucial in every MSA (Microservice Architecture) to link the various microservices. Solutions based on MSAs and DevOps are effective, but bring some challenges. While microservices allow flexible, agile deployments, they can be harder to manage and can create complex scenarios. • How to establish effective continuous integration and delivery pipelines using Red Hat® OpenShift, Docker, and Kubernetes. • How to get security, control, and visibility of the microservice APIs using the 3scale by Red Hat API management platform and the 3scale nginx-based API gateway running on Docker. Traditionally, business process management (BPM) programs have focused on standardization and continuous improvement— but programs that require discovery, modeling, and analysis can result in long lead times. And businesses can no longer tolerate long implementations as they need to react quickly to changing customer expectations. Red Hat® JBoss® BPM Suite can be integrated into a MSA (Microservice Architecture) to support frequent deployments, multiple concurrent versions, and flexible scaling; enabling IT to respond more quickly to the needs of the business. Awareness and interest in microservices has been growing exceptionally fast, with the promise of rapid gains in productivity and innovation getting the attention of IT practitioners at every level. Yet questions and misunderstandings persist. • Introduction to containerized integrations: Red Hat JBoss® Fuse integration services on Red Hat OpenShift Container Platform. Red Hat JBoss Middleware transformat your costly, hard-to-manage application infrastructure into one that is truly dynamic across multiple environments. That's why thousands of customers around the globe - large and small, in early every vertical - trust Red Hat JBoss Middleware.